For upper limb surgeries below shoulder joint, the brachial plexus block using supraclavicular approach introduced by Kulenkampff has gained popularity. Local anesthetics used alone in supraclavicular block provide analgesia for 4–8 h. Drugs such as morphine, tramadol, clonidine, butorphanol, dexmedetomidine, midazolam, and ketamine,,,, used as adjuvants prolong postoperative analgesia. They were associated with side effects such as sedation, nausea, bradycardia, hypotension, and psychosomatic effects. Dexamethasone inhibits synthesis of cyclooxygenase-2 in the peripheral tissues and central nervous system, reducing the prostaglandin production responsible for inflammation and pain. The use of dexamethasone was found to prolong the duration of action of local anesthetic. Hence, we conducted this study to compare the action of perineural dexamethasone in supraclavicular with intravenous (IV) dexamethasone after supraclavicular block. After obtaining the Institutional Ethical Committee approval, this double-blind study included 60 American Society of Anesthesiologists (ASA) physical status Classes I and II patients posted for upper limb surgeries below the shoulder joint. They were randomly allocated into two groups, using computer-generated random number tables as Group BD (in which patients received dexamethasone as an adjuvant in supraclavicular block) and Group BI (in which patients received IV dexamethasone after supraclavicular block). In all patients, we used injection lignocaine with adrenaline 2% 10 mL, injection bupivacaine 0.5% 20 mL, and 5 mL normal saline (NS). In BD group, injection dexamethasone 0.05 mg/kg was added to the solution along with IV NS 1cc while the BI group received 0.05 mg/kg injection dexamethasone intravenously. Patients posted for upper limb surgery below shoulder. ASA physical status Classes III and IV patients. Thorough preoperative assessment was done of all the patients in preanesthesia checkup. Baseline investigations were done including hemogram, blood sugar, urine routine, PT/INR, and electrocardiogram (ECG), renal function test, and chest X-ray if age more than 40 years. Patients were explained the procedure of block preoperatively in detail. Informed valid consent was taken. Inside the operation theater, all the standard monitors were applied. An IV line was secured. Oxygen supplementation was done with mask at 4 L/min. We used the classical approach to block the supraclavicular plexus using the single-shot nerve stimulator technique. The patient was made to lie in supine position with a pillow under the shoulder, and head was turned slightly to the opposite side. The arm was placed by the side with flexion at elbow and the wrist resting on the patient's abdomen so that the contractions were easily detected. The part of the neck was aseptically cleaned and draped. After palpating the subclavian artery, the site was infiltrated with local anesthetic just lateral to the pulsations. We used the Stimuplex 50 mm insulated needle to perform the block. Grounding was done with the help of an ECG lead along the distribution of the nerve root. Stimulation was done starting at 2 mA current, and the nerve stimulator frequency was set at 1 Hz. Once the desired response was obtained, i.e., contractions of fingers, the current was gradually decreased to 0.6 mA, and further decreased to 0.4 mA to see if response disappears. If it was still present the needle was repositioned to get response at 0.6 mA but not at 0.4 mA. In all patients, we used injection lignocaine with adrenaline 2% 10 mL, injection bupivacaine 0.5% 20 mL, and 5 mL NS. In BD group, injection dexamethasone 0.05 mg/kg was added to the solution along with IV NS 1cc while the BI group received 0.05 mg/kg injection dexamethasone intravenously. 2 = Complete block (no sensation). 2 = Complete block (no muscle activity). Thumb adduction and opposition with little finger (ulnar nerve). Postoperative follow-up was done in recovery room and wards. The duration of analgesia was assessed using the 0–10 visual analog scale (VAS) for pain at every hour for the first 10 h and then two hourly for the next 24 h.
The VAS score more than 4–6 was considered as a termination of analgesic action of the block and rescue analgesia was given in the form of injection paracetamol 1 g IV. The time when the patient was able to move his/her fingers and raise hand was considered as cessation of motor effect. If any complications such as Horner's syndrome, pneumothorax, local anesthetic toxicity, partial effect, nausea, vomiting, and phrenic nerve palsy were immediately treated. Such cases were excluded from the study. The above observations were carried out by the investigator who was blinded for the mode of administration of injection dexamethasone. If the block was inadequate or failed, or the surgery was extended, and effect of block wears off, then general anesthesia was supplemented. Two patients from BD Group and one patient from BI Group was excluded from the study because of block failure. They were given general anesthesia. The sample size was determined based on previous studies. Talukdar et al. used sample size of 23, which was determined considering mean difference of 1.75 min, with a confidence interval of 95% and 80% power of the study. Considering nonresponse and dropouts we took a sample size of 30 in each group (total no = 60). Data analysis was done using IBM SPSS version 20:0 (Chicago, USA) demographic data and continuous variables were analyzed by independent sample t-test. Categorical data were analyzed by unpaired t-test. P < 0.05 was considered statistically significant. Both groups BD (dexamethasone added as an adjuvant in supraclavicular block) and BI (IV dexamethasone after supraclavicular block) were comparable in terms of demographic parameters as shown in [Table 1]. [Table 2] shows that onset of sensory and motor block in both BD and BI group was not statistically significant. As shown in [Table 3], time for complete motor and sensory block in both BD and BI group was not statistically significant. On the other hand, the duration of sensory block [Table 4] and [Graph 1] was found to be significantly prolonged in group BD (14.63 ± 2.34) hours H as compared to group BI (9.33 ± 1.09) H where P < 0.001. 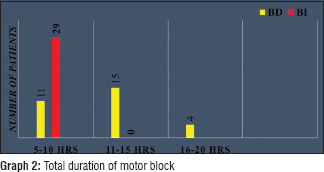 Furthermore, the total duration of motor block was significantly prolonged in BD group (12 ± 2.11) H as compared to BI group (7.17 ± 0.95) H (P ≤ 0.001) [Table 5] and [Graph 2]. We found that time required for rescue analgesic in BD group (15 ± 2.6) H and BI group (10.3 ± 1.07) H was also statistically significant (P < 0.0001) [Graph 3]. Preoperative dexamethasone by oral and IV routes has been found to reduce overall pain scores and analgesic requirements without any adverse effects. Using dexamethasone as an additive to local anesthetics was found to prolong the duration of analgesia as well as produce earlier onset of the block. Dexamethasone, a synthetic derivative has a potent anti-inflammatory property and is devoid of mineralocorticoid activity. It also inhibits synthesis of cyclooxygenase-2 in peripheral tissues and central nervous system, thus reducing prostaglandin production responsible for pain and inflammation. Steroids produce analgesia by blocking transmission of nociceptive myelinated type C fibers and suppressing ectopic neuronal discharge. It is postulated that alteration in the function of potassium channels in the excitable cells may cause this effect. IV dexamethasone possibly increases the anti-inflammatory proteins and decrease the inflammatory proteins. Shrestha et al., Pathak et al. and others have used 8 mg dexamethasone as an adjuvant in block.,,, However, in few other studies, almost similar results were achieved using dexamethasone in dose of 0.05 mg/kg and 0.02 mg/kg. Furthermore, Persec et al. have evaluated low-dose dexamethasone in conjugation with plain levobupivacaine for brachial plexus blockade at supraclavicular level with almost same duration of analgesia as other studies. Hence, in the reported study, we decided to use dexamethasone in dose of 0.05 mg/kg. We assessed the onset of sensory block using blunt end of 24G needle at 0, 3, 5, 10, 15, 20, 30 min. In our study, we found that the difference in onset of sensory blockade between the groups BD (6.92 ± 1.55) min and group BI (5.92 ± 2.12) min was not statistically significant (P = 0.63). Our findings correlate with other study by Pathak et al. who found sensory onset in Group I (patients with perineural dexamethasone) (5.92 ± 2.82) min and (6.6 ± 2.958) min in Group II (patients with NS) (P = 0.4101). In contrast to our findings Shrestha et al., Islam et al. found that the addition of dexamethasone leads to early onset of sensory and motor blockade. Similar findings were seen in study by Biradar et al. We found that mean onset of motor block in BD group was (9.48 ± 3.24) min as against (7.84 ± 3.37) min in BI group (P = 0.086) which was not significant. Pathak et al. had similar observations. On the contrary Islam et al. found that there was faster onset of motor block in group with steroid used as an additive in supraclavicular block. We also compared the total duration of sensory and motor blockade in both groups. In group BD the sensory block lasted for (14.63 ± 2.34) H as against (9.33 ± 1.09) H in group BI. The P < 0.001 was statistically significant. The motor block in group BD was for (12.67 ± 2.11) H and in group BI (7.17 ± 0.95) H where P < 0.001. We observed that the postoperative analgesia was also prolonged as is evident from the time required for rescue analgesia, in BD group (15.8 ± 2.6) H and group BI (10.3 ± 1.07) H [Graph 3] Pathak et al., Persec et al., Islam et al. and Biradar et al. also had similar observations that group where steroid was used as an adjuvant had prolonged postoperative analgesia. Our study results showing the duration of analgesia for BD group (15.8 ± 2.6) H were comparable to the meta-analysis done by Choi et al. where from nine trials 801 patients were included. They concluded that dexamethasone prolonged the analgesic duration for long-acting local anesthetic from 730 to 1306 min (mean difference = 576 min). De Oliveira, Desmet et al. also had similar findings. Rosenfeld et al. observed that 8 mg. perineural dexamethasone and IV dexamethasone with ropivacaine interscalene block prolonged the duration of analgesia and reduced the pain scores. Duration in both groups was comparable. Our results for the duration of analgesia in BI group were (9.33 ± 1.09) H were comparable to study by Dhanges et al. who found that IV injection of low dose 2 mg dexamethasone significantly prolongs the duration of analgesia and motor block in patients undergoing upper limb surgeries under supraclavicular block. In their study, the duration of analgesia was (11.88 ± 1.31) H in IV dexamethasone group whereas (6.47 ± 0.93) H in the NS group. In a study Abdallah et al., found that IV dexamethasone and perineural dexamethasone both prolonged the duration of analgesia, but the duration was not significantly different. Our study suggested that perineural dexamethasone prolongs the postoperative analgesia is mainly due to its effect at the nerve roots and not much due to its action after systemic absorption. Further studies are needed for definitive conclusions. Prolonged motor blockade prevented the early recognition of iatrogenic nerve injury. Effects of dexamethasone on blood glucose levels delayed neurological effects of perineural dexamethasone, and adrenal suppression which may be a theoretical possibility were not checked. This was limitation of our study. From this study, we can conclude that low-dose perineural dexamethasone 0.05 mg/kg added as an adjuvant to local anesthetics in supraclavicular block provides excellent and prolong postoperative analgesia. We recommend the use of low-dose dexamethasone in block to decrease the need of opioids and nonsteroidal anti-inflammatory drugs postoperatively as rescue analgesics and thereby avoid the associated complications. Kulenkampff D. Anesthesia of the brachial plexus. Zentralbl Chir 1911;38:1337-40. Neal JM, Gerancher JC, Hebl JR, Ilfeld BM, McCartney CJ, Franco CD, et al. Upper extremity regional anesthesia: Essentials of our current understanding, 2008. Reg Anesth Pain Med 2009;34:134-70. Wakhlo R, Gupta V, Raina A, Gupta SD, Lahori VU. Supraclavicular plexus block: Effect of adding tramadol or butorphanol as an adjuncts to local anaesthetic on motor and sensory block andduration of post-operative analgesia. J Anaesth Clin Pharmacol 2009;25:17-20. Iohom G, Machmachi A, Diarra DP, Khatouf M, Boileau S, Dap F, et al. The effects of clonidine added to mepivacaine for paronychia surgery under axillary brachial plexus block. Anesth Analg 2005;100:1179-83. Lalla RK, Anant S, Nanda HS. Verapamil as an adjunct to local anaesthetic for brachial plexus blocks. Med J Armed Forces India 2010;66:22-4. Clerc S, Vuilleumier H, Frascarolo P, Spahn DR, Gardaz JP. Is the effect of inguinal field block with 0.5% bupivacaine on postoperative pain after hernia repair enhanced by addition of ketorolac or S (+) ketamine? Clin J Pain 2005;21:101-5. Jarbo K, Batra YK, Panda NB. Brachial plexus block with midazolam and bupivacaine improves analgesia. Can J Anaesth 2005;52:822-6. Hong JY, Han SW, Kim WO, Kim EJ, Kil HK. Effect of dexamethasone in combination with caudal analgesia on postoperative pain control in day-case paediatric orchiopexy. Br J Anaesth 2010;105:506-10. Talukdar M, Begum H, Shoman MM, Khatu UH. Anaesthetic and analgesic effects of adding dexamethasone to bupivacaine in supraclavicular brachial plexus block – A comparative study. J Bangladesh Coll Phys Surg 2013;31:11-7. Elhakim M, Ali NM, Rashed I, Riad MK, Refat M. Dexamethasone reduces postoperative vomiting and pain after pediatric tonsillectomy. Can J Anaesth 2003;50:392-7. Golwala MP, Swadia VN, Dhimar AA, Sridhar NV. Pain relief by dexamethasone as an adjuvant to local anaesthetics in supraclavicular brachial plexus block. J Anaesth Clin Pharmacol 2009;25:285-8. Benzon HT. Epidural steroids. In: Raj PP, editor. Pain Medicine, a Comprehensive Review. UK: Mosby Publications; 1999. Shrestha BR, Maharjan SK, Tabedar S. Supraclavicular brachial plexus block with and without dexamethasone – A comparative study. Kathmandu Univ Med J 2003;1:158-60. Arish BT, Babu DD, Lazarus SP, Chandar DD, Balasubramanian S, Kumar KS. Effect of dexamethasone as an adjuvant to local anesthetic in supraclavicular brachial plexus block. Int J Sci Stud 2016;3:147-53. Movafegh A, Razazian M, Hajimaohamadi F, Meysamie A. Dexamethasone added to lidocaine prolongs axillary brachial plexus blockade. Anesth Analg 2006;102:263-7. Pathak RG, Anand PS, Rajendra NK. Supraclavicular brachial plexus block with and without dexamethasone – A comparative study. Int J Sci Res Publ 2012;12:1-7. Liu J, Richman KA, Grodofsky SR, Bhatt S, Huffman GR, Kelly JD 4th, et al. Is there a dose response of dexamethasone as adjuvant for supraclavicular brachial plexus nerve block? A prospective randomized double-blinded clinical study. J Clin Anesth 2015;27:237-42. Persec J, Persec Z, Kopljar M, Zupcic M, Sakic L, Zrinjscak IK, et al. Low-dose dexamethasone with levobupivacaine improves analgesia after supraclavicular brachial plexus blockade. Int Orthop 2014;38:101-5. Islam SM, Hossain MH, Maruf AA. Effect of addition of dexamethasone to local anaesthetics in supraclavicular brachial plexus block. J Armed Forces Med Coll Bangladesh 2011;7:11-4. Choi S, Rodseth R, McCartney CJ. Effects of dexamethasone as a local anaesthetic adjuvant for brachial plexus block: A systematic review and meta-analysis of randomized trials. Br J Anaesth 2014;112:427-39. De Oliveira GS Jr., Castro Alves LJ, Nader A, Kendall MC, Rahangdale R, McCarthy RJ, et al. Perineural dexamethasone to improve postoperative analgesia with peripheral nerve blocks: A meta-analysis of randomized controlled trials. Pain Res Treat 2014;2014:179029. Desmet M, Braems H, Reynvoet M, Plasschaert S, Van Cauwelaert J, Pottel H, et al. I.V. And perineural dexamethasone are equivalent in increasing the analgesic duration of a single-shot interscalene block with ropivacaine for shoulder surgery: A prospective, randomized, placebo-controlled study. Br J Anaesth 2013;111:445-52. Rosenfeld D, Ivancic M, Hattrup S, Renfree K, Watkins A, Hentz J, et al. Perineural vs. intravenous dexamethasone as adjuncts to local anaesthetic brachial plexus block for shoulder surgery. Anaesthesia 2016;71:380-8. Abdallah FW, Johnson J, Chan V, Murgatroyd H, Ghafari M, Ami N, et al. Intravenous dexamethasone and perineural dexamethasone similarly prolong the duration of analgesia after supraclavicular brachial plexus block: A randomized, triple-arm, double-blind, placebo-controlled trial. Reg Anesth Pain Med 2015;40:125-32.